Secretary of War Newton D. Baker, who exposed himself to fire. Fort de Marre, Verdun. 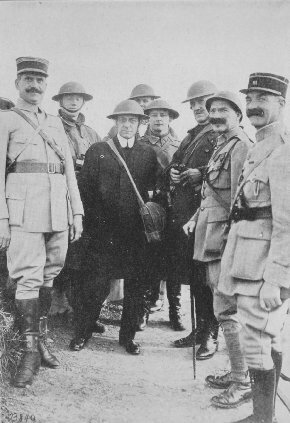 Secretary Baker in center, Brigadier-General Douglas McArthur and Captain Dettweiler, French officer in helmet, on the left of the Secretary. 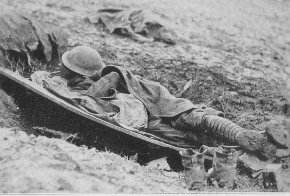 Soldier of the 32nd Division asleep on hammock suspended across shell holes in order to avoid the mud and obtain much needed rest. Near Epinonville, October 18, 1918. 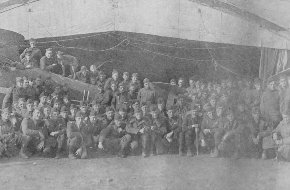 Pilots of the 94th Aero Squadron in front of German plane, recently brought down by 1st Lieutenant E. V. Rickenbacker. Near Rembercourt, October 18, 1918. This unit brought down sixty-nine enemy planes.